This simply structured ballad from Miami isn’t all that rare but it certainly deserves more attention than it has so far garnered. The bare gospel style backing of organ/arpeggio guitar/bass and drums couldn’t be more basic but the emotion laid out by the vocalists more than makes up for the lack of prettification. Great powerful lead and some nice harmonies are just what the doctor ordered. 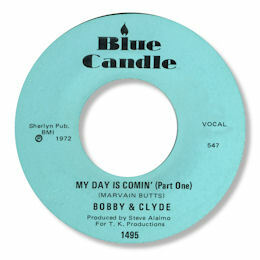 Who are Bobby & Clyde? I don’t know – but there are at least three voices on the disc. 1963 Appeared with Extensions (sisters & friends) on Ted Mack Amateur Hour. Appeared in local talent contests. 1963-65 Formed Soul Brothers with local talent and performed locally, college venues, etc. 1965-68 Left Soul Brothers with another member of the group, George Davis, and headed to New Jersey. Started The Broadways and did several local venues promoting our group. Billy Brown (Ray, Goodman & Brown) began his career with The Broadways. 1968 Went to California, entered talent shows. 1969 Offered the opening act with The Soul Patrol for the Platters. 1969 Returned to Iowa due to illness in the family. 1970-75 Toured with Bobby Marchan throughout Southern States – Florida, Georgia, Alabama. 1978 Appeared on The Gong Show, sang “Music on My Mind”, aired in April 1978. 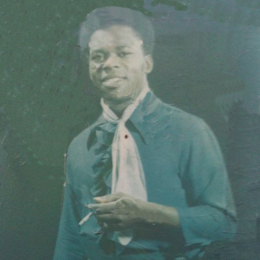 Mr Shawn Edmonds has very kindly also supplied the splendid vintage picture of his father. I'm very grateful to both the Messrs Edmonds for getting in touch. As a post script I was astonished to find out that the "Bobby" in question is Bobby Marchan. Who would have thought it!